Dream god Oneiros (夢神・オネイロス Mushin Oneirosu?) is the leader of the gods of Dreams. He is absent in Greek mythology, for his very name in the myth is spelled as Oneiroi, the colloquial term that referred Morpheus, Icelos and Phantasos. This hints his true power, as Oneiros is the only son of Hypnos without a power of his own. 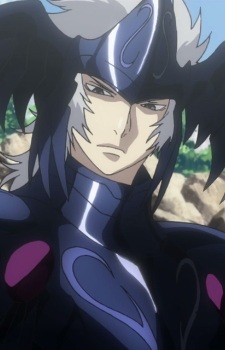 Instead, after challenging Capricorn El Cid and Pegasus Tenma, he merged with the power of his brothers (fulfilling his role as union of the three Oneiroi, Phantasos, Icelos and Morpheus). In this state Oneiros' body ends in his hips, and instead of legs he has a massive armored centaur-like creature, plus two additional arms on his shoulders. With his Guardian's Oracle (ガーディアンズオラクル Gādianzu Orakuru?) he can extinguish the souls of their enemies preventing them to reincarnate. Oneiros in this form is immune to the cut of El Cid's Excalibur, as he shows by rejoining his body after being split in half. He is however successfully defeated by a combined effort between Sisyphos' arrow and El Cid's self-sacrifice.